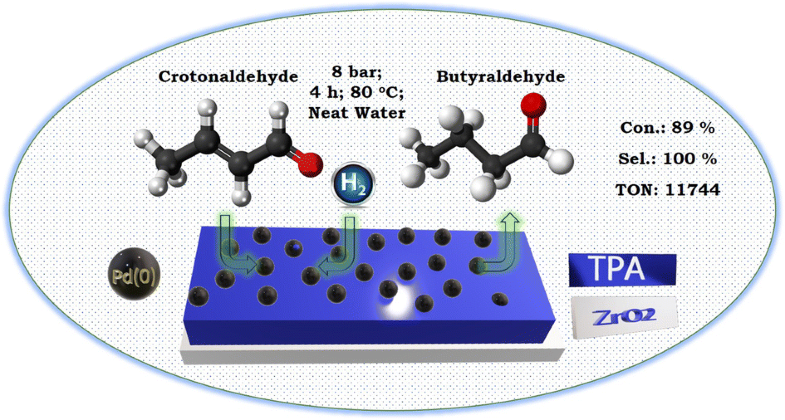 Stabilized Pd(0) nanoparticles by supported 12-tungstophosphoric acid (Pd(0)-TPA/ZrO2) was explored as a sustainable recyclable catalyst for selective C=C hydrogenation of cyclohexene and crotonaldehyde. The catalyst shows an outstanding performance [catalyst to substrate ratio (1:1.31 × 104)] towards high conversion as well as 100% selectivity of the desired product with high turnover number (> 10,000) and turnover frequency (> 2600 h−1) for both the systems. The use of neat water as a solvent and mild reaction conditions makes the present system environmentally benign and green. Moreover, the catalyst could be recovered and reused up to five cycles without any significant loss in their conversion as well as selectivity. The viability of the catalyst was evaluated towards different aromatic as well as aliphatic arenes and found to be excellent in all the cases. The obtained selectivity, especially butyraldehyde, was correlated with the nature of the catalyst as well as solvent and based on the study, a plausible mechanism for both the reactions was also proposed. 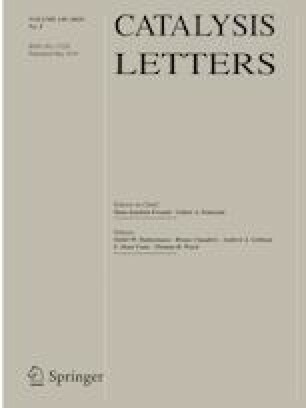 The online version of this article ( https://doi.org/10.1007/s10562-019-02763-1) contains supplementary material, which is available to authorized users. We are thankful to Department of Atomic Energy (DAE) and Board of Research in Nuclear Science (BRNS), Project No. 37(2)/14/34/2014-BRNS, Mumbai, for the financial support. One of the authors Mr. Anish Patel is thankful to the same for the grant of JRF. We are also thankful to Department of Chemistry, The Maharaja Sayajirao University of Baroda for BET surface area analysis.